Nucleic-acid amplification is a crucial step in nucleic-acid-sequence-detection assays. 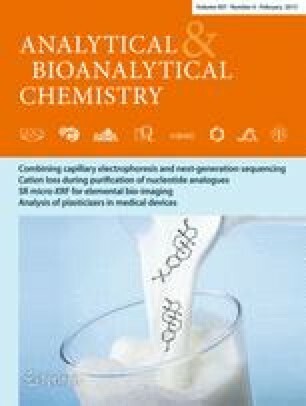 The use of digital microfluidic devices to miniaturize amplification techniques reduces the required sample volume and the analysis time and offers new possibilities for process automation and integration in a single device. The recently introduced droplet polymerase-chain-reaction (PCR) amplification methods require repeated cycles of two or three temperature-dependent steps during the amplification of the nucleic-acid target sequence. In contrast, low-temperature isothermal-amplification methods have no need for thermal cycling, thus requiring simplified microfluidic-device features. Here, the combined use of digital microfluidics and molecular-beacon (MB)-assisted isothermal circular-strand-displacement polymerization (ICSDP) to detect microRNA-210 sequences is described. MicroRNA-210 has been described as the most consistently and predominantly upregulated hypoxia-inducible factor. The nmol L−1–pmol L−1 detection capabilities of the method were first tested by targeting single-stranded DNA sequences from the genetically modified Roundup Ready soybean. The ability of the droplet-ICSDP method to discriminate between full-matched, single-mismatched, and unrelated sequences was also investigated. The detection of a range of nmol L−1–pmol L−1 microRNA-210 solutions compartmentalized in nanoliter-sized droplets was performed, establishing the ability of the method to detect as little as 10−18 mol of microRNA target sequences compartmentalized in 20 nL droplets. The suitability of the method for biological samples was tested by detecting microRNA-210 from transfected K562 cells. The online version of this article (doi: 10.1007/s00216-014-8405-4) contains supplementary material, which is available to authorized users. MIUR (PRIN 20093N774P), Ministry of Health, Italy (n. 098/GR-2009-1596647), COST Action TD1003-Bio-inspired nanotechnologies: from concepts to applications and the Italian Association for Cancer Research (AIRC 13575: Peptide nucleic acids targeting oncomiR and tumor-suppressor miRNAs: cancer diagnosis and therapy) are acknowledged for partial financial support.